Most avocados are grown on family farms in California. It is good farming to support, and the results are a tasty treat. I adore avocados prepared in many ways, but often revert to the simplest way imaginable: halved, pitted, sprinkled with good salt and doused with a squeeze of fresh lime juice. Grab a spoon and have a snack! Guacamole is a favorite of mine. Actually anything with avocado suits me just fine. Give me a big bag of crispy, crunchy tortilla chips and a big bowl of guacamole and I am one happy camper. I can call it lunch, dinner, snack, whatever. Guacamole, like so many things in life, is so much better when you make it at home. Forget about that weird bright green goopy stuff you see in plastic tubs at the grocery store or the so-called homemade in the plastic bags. That stuff, is just wrong! Make the real thing and I promise, you won’t regret it!! Really, it can be as simple as mashing up some avocado with fresh lime juice, salt and pepper. I like to add in some fresh cilantro for an extra bit of deliciousness. My favorite renditions are ones that have a bit of tomato and bacon or that have a little bit of a Thai flair going on: fish sauce, shallots, Thai chili, lemon juice and lots of freshly cracked black pepper. 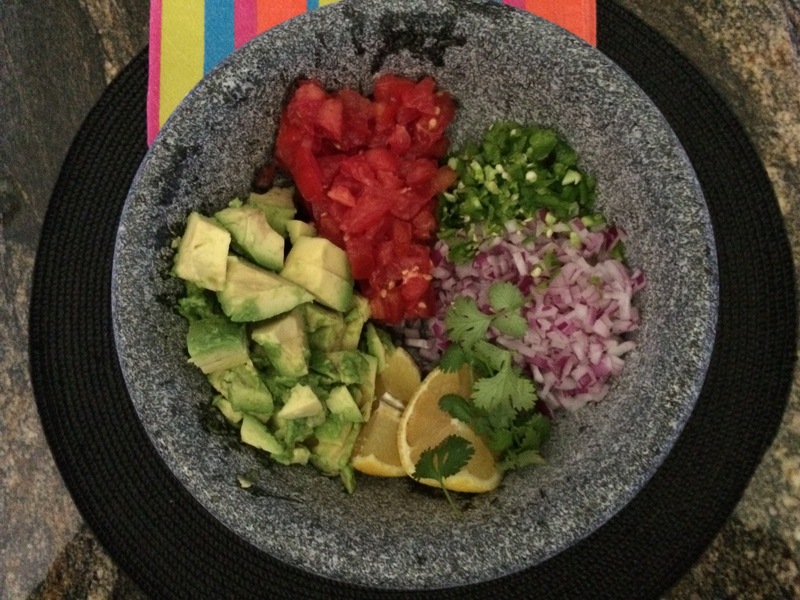 Of course, if you aren’t the adventurous type, you can do a straight up classic guacamole. I’ve included three different variations here. 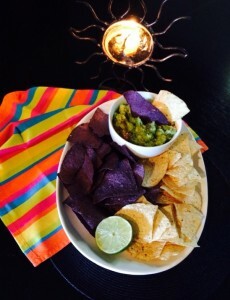 Go guacamole friends and be spicy!! If you’re adverse to spice but want a little bit, just de-seed the jalapeños. The membranes (white parts) and seeds of a pepper are the hottest. Some people just do not like cilantro (something I just don’t understand) but you can substitute Italian (flat-leaf) parsley for the cilantro if necessary. As I have stated, I love, love guacamole and this southern version keeps it pretty simple – when you hit that toasty goodness in the pecans, it just plays up the rich, fresh flavor of the avocado. Place avocados and lime juice in a bowl and roughly mash with a fork. Stir in onion, cilantro, jalapeno, pecans, salt and pepper. Place avocados and lemon juice in a bowl and roughly mash with a fork. Stir in shallot, cilantro, mint, chili peppers, fish sauce, salt and black pepper. Fresh salsa, or salsa cruda, is an excellent way to showcase the natural sweetness of raw summer tomatoes. 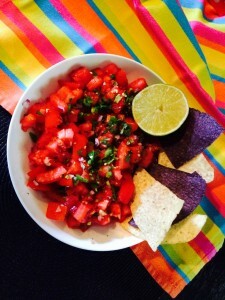 Fresh, chunky salsa emphasizes the tomatoes, not the add-ins. To limit wateriness and concentrate the flavor, drain tomatoes in a colander. To combine the ingredients, simply layer them on top of the tomatoes while they drain. 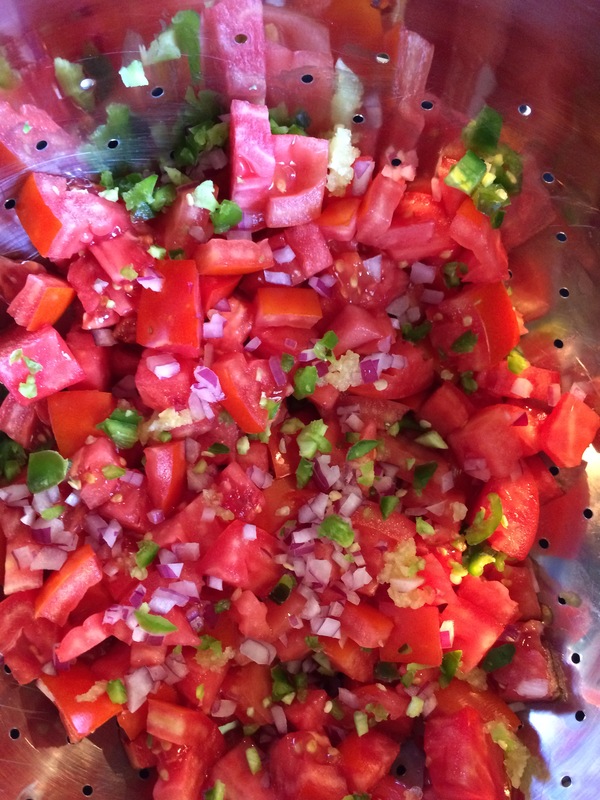 Once the tomatoes are ready, the salsa needs only a few stirs. 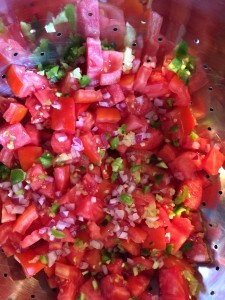 Salsa can be made 2-3 hours in advance, but hold off adding lime juice, salt, pepper and sugar until just before serving. A great accompaniment to grilled steak, chicken or fish. Ladies, good news about salsa – it’s figure friendly! The tomatoes contain fiber and water, which helps you stay fuller longer. They are also loaded with lycopene, which helps build strong bones and protect your skin from the aging rays of the sun. It takes grilled salmon and chicken breast to a whole new level. When served with veggies, it’s a dieter’s dream. Place tomatoes in a colander over a bowl and let drain for 30 minutes. Layer onion, cilantro, jalapeno, and garlic on top of tomatoes. Shake colander to drain excess juice. Discard juice; wipe out bowl and transfer ingredients to bowl and toss gently to combine. Add salt, black pepper, and ½ teaspoon sugar and toss gently. Taste and add additional lime juice and/or sugar, if needed. Serve at room temperature or chill and serve. Amounts of lime juice and sugar depends on ripeness of tomatoes. While fresh tomato salsa with tortilla chips is one of summer’s greatest pleasures, corn salsa is an excellent alternative (or addition) to the norm. 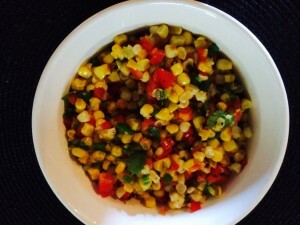 Corn salsa is nothing new, but most versions taste wan and under seasoned compared to lively tomato salsa, and the corn can be soft and unappealing. Deep flavors and crunchy texture is what you should strive for. Toasted corn has a deeper, more concentrated flavor and crunchier texture, both of which contribute to a superior corn salsa. Corn’s high sugar content makes toasting it in a nonstick skillet an easy and quick preparation. The following recipe features red bell pepper for more crunch and garden-fresh flavor, half of a jalapeño gives just the right amount of heat, fresh lime juice adds brightness, cumin contributes warmth, cilantro and scallion provides a fresh finish. Heat olive oil in a 12-inch skillet over medium-high until shimmering. Add corn kernels and cook, stirring occasionally, until deep golden brown, about 6 to 8 minutes. Transfer to a large bowl and let cool slightly. Add bell pepper, lime juice, cilantro, scallion, jalapeño, garlic, cumin, salt and pepper to corn and toss gently to combine. Tase and adjust seasonings if needed. Cover and chill for 1 hour before serving. Just before serving stir in 1 tablespoon olive oil. Free updates, product releases & recipes! Subscribe to Beyond Southern's email update and get a free chapter of my eCookbook.